I have a very out of date website at http://whiteravenarts.com. It's on my list to completely revamp and update now that I have a copy of Dreamweaver. I also have a deviantArt page (http://feynico.deviantart.com) which lately is more up-to-date. I only really started adding items in May this year. When I was a kid, my mom was always trying out some craft or another, so I started by trying out what she did. Then I discovered that sometimes it was possible to make things you liked but couldn't buy. It wasn't really until I started making books in the 1990s, though, that I really fell in love with making things. I don't remember exactly--it might have been on deviantArt--but I was looking at other people's work and I noticed that Etsy kept coming up. All this wonderful, talented work that I saw was also available to buy on Etsy. So when I began to think seriously again about selling my own work, it made sense to start with Etsy. It was very casual and haphazard until the mid-to-late 90s, when I was going to school in St John's, Newfoundland. I was studying folklore, so a lot of my classmates as well as my boyfriend at the time did craft of various kinds. It was then that I started making and selling handbound books. Then when I left Newfoundland, I didn't do much bookbinding except to make journals for myself until I started art school in 2005 and took some book arts classes. Sort of. I've always tried to avoid having a "real job." I'm a freelance writer, which can be a lot of work for not a lot of money, but it means I have a flexible schedule and work from home. Until recently I was also the assistant at the Dawson Printshop (http://nscad.ca/en/home/shopsandservices/dawsonprintshop.aspx), a letterpress shop at the Nova Scotia College of Art and Design. Unfortunately, the school closed the shop due to financial difficulties. I'm still able to use the facilities to some extent, so one of the things I have been working on the past couple of months is getting my own print jobs and making hand-printed greeting cards and other items. Does anyone help you? I wish I could hire someone to handle all the business aspects of my Etsy shops (and everything else, too), so I could just concentrate on designing and making. Alas, I can't afford it, so I do everything myself. My photographer/artist boyfriend gives me pointers on the photographs and descriptions if I ask, but that's about it. I have a lot more work finished that hasn't made it into my shops yet, because I'm a bit lazy about the business side of things. First of all, make what you love. If you're making something just because it sells, you'll soon get sick of it. Second, bring your own personal vision to your work. Don't be the umpteenth person to make exactly the same thing--figure out what it is you love most about what you do and what it is that makes your work just a little different and emphasize that. And third, think carefully about your pricing. Don't price your work too low and undercut everyone else just to make more sales. We all benefit--including the customer--when work is priced at what it's worth. That said, don't overprice either. not every piece is worth hundreds, no matter how fantastic you think it is. What I find challenging is not the crafting itself, but the selling. Sometimes it's hard to let go of a favorite piece, especially if it's one of a kind. I also find it very difficult to describe my work in a way that isn't just a list of techniques and materials. Which is kind of funny, because I'm also a writer. Writing fiction is one of my passions, so you'd think it would be easy to describe things. But I have this fear of overdoing it, I guess. The hardest thing of all is craft fairs. I love craft fairs and I love being around other people showing their work. But I'm just terrible at craft fair chat. I'm really not one of those people who can just start talking to whoever happens by. I've seen other people do that, just start talking to someone who doesn't even really seem that interested and end up making a sale from it. Plus, unlike some crafts, it's difficult to explain why customers should spend a lot more money to buy a handbound book when they can get something that seems just as good for cheap from WalMart. Some crafts it's easy to see why handmade is better, but books not so much. I do think that's changing, though, as more people become aware of handmade goods in general. In a way, I think the recession has made people more aware, and even made them more willing to spend a bit more money to get something unique and well-made rather than the mass-produced goods everyone has. I do. I've just started doing craft fairs again--the next one is in September, followed by Word on the Street. And I have a couple of local shops carrying my letterpress cards and books. It's part of my plan to get my work in more shops, and maybe start submitting to local art shows, too. Just one more chapter . . . I've always loved books. I don't remember learning to read, so it almost seems like I was born reading. At some point, the love of reading books began to include a love of the form of books, too. I realized somewhere along the line that the pleasures of reading could be enhanced if the book was well made and/or beautiful. And when I began to keep a regular journal, I discovered that a really great blank book made me want to spend more time with it, writing and reflecting on what I had written. So I began to make books--I was entirely self-taught at first--in order to make nicer books to write in than I could find in the shops. I soon found that other people liked my books, too and realized that maybe I could sell them. I've been puttering with craft of one sort or another since I was a kid, but rarely very seriously. In the 1990s I taught myself how to do case binding and Japanese 4-hole stab-stitch bindings. That was pretty much all I knew how to do until the mid-2000s when I went to art school. I was lucky to meet two fantastic teachers who have both had formal European training, but who are also both interested in innovation and exploration. So I had support and encouragement for whatever I wanted to do. I'd love to be able to study in Europe myself, one day. I just learned a fantastic book structure called K-118. It's a super-flexible tight-backed medieval structure that works with just about any kind of sewing. I'm totally in love with K-118, but it's too labour-intensive to use for regular store stock. I'd have to charge too much. But it's definitely my new structure of choice for special work. I tend to also make a lot of cross-structure books because they're relatively quick for a fully-sewn structure, but they're also sturdy and look great. 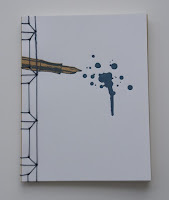 My latest line of blank journals, the SteamBook series, is cross-structure. I've discovered it's possible to make books without any tools at all, but good tools sure do make things easier and neater. I think my minimal tool kit now would be a bone folder, a good sharp knife, a needle, a straight edge and a glue brush. And some sort of weight. But I can improvise if I have to. As for supplies, the question made me wonder if it's possible to make a paperless book. I think it is, but I love paper too much to bother to find out. 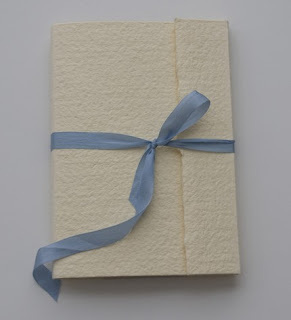 Depends on the book, but most of them use two or three kinds of paper (pages, endpapers and cover), linen thread and paste or pva. Bookcloth sometimes (I'm working on my own line of blockprinted cloth, which will be a lot of fun to use), or leather. 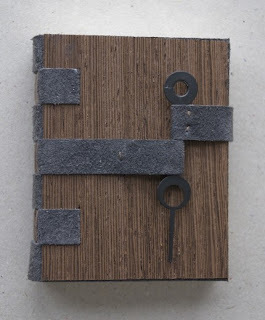 The SteamBooks use recycled garment suede and wood veneer. I've wanted to use wood veneer in some way for a long time, and finally came up with a solution I'm really happy with. I find so many things inspiring. I guess nature and science are the big ones. Even if I don't get specific ideas from being in nature or reading about science, I get this intense feeling of awe that makes me want to immediately start making art. I'm not sure I have one specific hero. My book arts teacher and mentor, Joe Landry, is an important figure for me. I aspire to know as much about books as he does some day. Then there's William Morris, who revived handcraft in the 19th century and started the Arts and Crafts movement in England. He wanted to learn everything--he wrote and illustrated his own books, learned weaving to create his own textiles, designed typefaces based on medieval scripts . . . And of course there's my mom, who has always encouraged me to try new things. I was going to say "reading," but I decided some time ago that I shouldn't feel guilty about reading, so I'll say "chocolate." I am the binder who developed the K-118. Just for future reference it's not constructed just as a tight back. It is also adaptable for hollow backs and album structure. In bookbinding, as well as any craft endeavor, one needs to be careful who they are being taught by. Of all the present proponents of the K-118, none have actually seen constructed or handled a K-118 that has been bound by myself. While I've published several articles with pictures the structure has evolved over the years with many nuances. When I've seen several examples by people who "teach" the structure it's obvious that those developed nuances were not apprehended by the instructors. Just a note of caution. It has also, in the past, been presented as the work of some of the teachers. I've had to correct that in several instances. There are many bull shitters who don't like to attribute. Good luck. Yes, thank you. That's one of my articles.